Have you tried the new version of Twin Spin Deluxe? It’s one of the most played games across NetEnt Casinos, and it’s about to get even more popular. 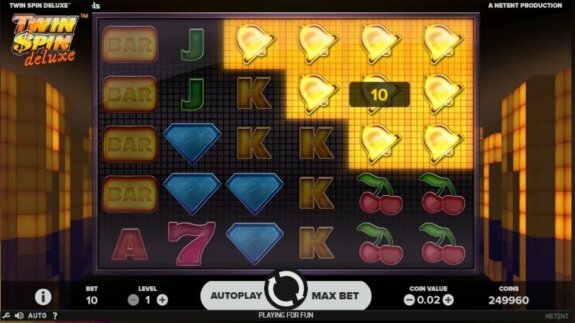 Since the game was released just a few months ago, we’ve decided to give our readers an insight into its working mechanism in this Twin Spin Deluxe Slot Review. 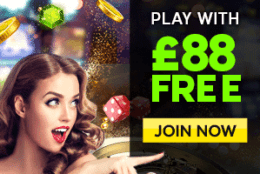 Afterwards, you can visit any one of the NetEnt Casinos where you can play it for free as you familiarise yourself with all the features highlighted below. Why Twin Spin Deluxe? A remake of the classic Twin Spin, now with 6 reels! More chances to win and every more fun. Ready to level up you game? Where to play Twin Spin Deluxe? Please gamble responsibly. 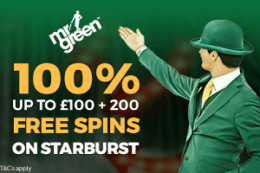 Offer only valid for UK and Northern Ireland, Wagering requirements 40x. Min. deposit £10. General Terms & Conditions apply. Most of the casino players who play NetEnt games are very familiar with Twin Spin Deluxe slot. 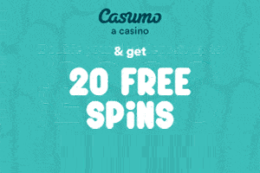 The game’s predecessor is the classic Twin Spin, which is also very familiar with most of the casino players. However, it’s not the only game from NetEnt that has a similar setting. Games such as The Legend of Shangri-La and Aloha! Cluster Pays are similar too. And all these games are linked together with one feature – the cluster pays system, which has replaced the usual paylines system. This means that the deluxe version is pretty much the same as the predecessor, but with the cluster pays system instead of the 243 unique ways of winning. In addition to this, NetEnt has also re-designed the original version to give the deluxe game an improved look. 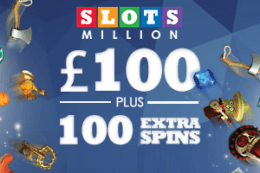 Thanks to the cluster pays system; Twin Spin Deluxe offers frequent wins with a prospective of winning big. It also features the same ‘twin spin’ feature, which adds a little fun twist to the game. If you really enjoyed playing the original title back in 2013, we are sure that you’ll love the deluxe version! 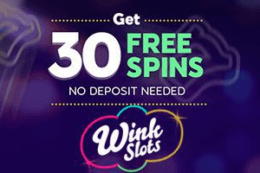 When NetEnt were releasing Twin Spin slot, they said that they were infusing the classic Las Vegas entertainment with the most advanced new age slot technology. Their addition, Twin Spin Deluxe, ups the gameplay even further. The game’s reels constitute of hundreds of smaller grids, while the geometric shapes flicker and shine on the outer side of the reels. This will give you the impression that you are constantly moving through a large corridor filled with lights that flicker as per the Techno beat that plays in the background – much like the one that’s been used in Joker Pro and Neon Staxx slots. And the game’s symbols are surely reminiscent of Joker Pro Slot. There are straight cut jacks through Aces, which complement the BARs, Cherries, Bells, Diamonds and 7s, which are the game’s high paying symbols. Instead of using the original 243 ways of winning structure, Twin Spin Deluxe has the Cluster Pays mechanism. Any symbols lying side by side and form a cluster that constitutes of nine of more symbols delivers a payout. Landing such a cluster that constitutes of the game’s top paying Diamond symbols will deliver the highest payout achievable in Twin Spin Deluxe, which stretches to a delicious €100,000. 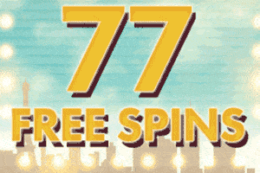 Play Twin Spin Deluxe for free! As soon as you’ve select the spin button, the game randomly picks two adjacent reels and links them together. As the reels continue spinning, the twin reels expand to produce 3, 4, 5 or if you are lucky, 6 linked reels. Once the reels are linked, they’ll display the same symbols, i.e., if reel 3 and four are linked and reel 3 has Bars on rows 1 and 2, 7s on rows 3 and 4 and a Diamond on row 5, then reel four will also display the same symbols in the same fashion. But, since the symbols can appear partially or fully stacked, it’s possible for you to land a full stack of a given symbol displayed on multiple reels, which is where the largest wins are. 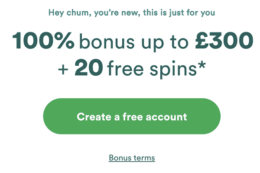 As we’ve mentioned, Twin Spin Deluxe uses a unique Cluster Pays mechanism, which substitutes for the regular paylines mechanism. To create winning combinations, you need to land nine or more matching symbols that are vertically horizontally or vertically adjacent to each other for form the cluster. Since you have a total of six reels, as well as the Cluster Pays symbol, it’s possible for you to form clusters from as many as thirty symbols. The highest paying symbol, the diamond symbol, will reward you the highest pay in the game, which is set at €100,000. 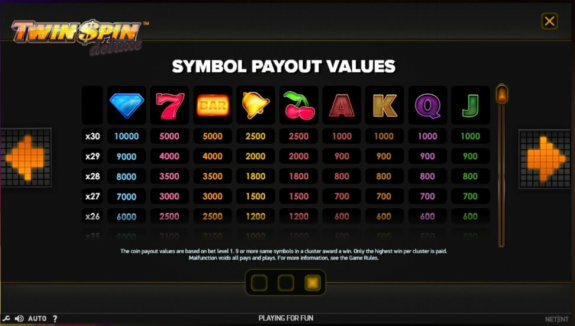 The Bar and seven symbol will reward you with €50,000; the Cherries and Bell symbols will reward you with €25,000 while the playing card symbols will reward you with €10,000. The gameplay in Twin Spin Deluxe is fast and furious. We were mesmerised by the game’s Twin Reel feature. 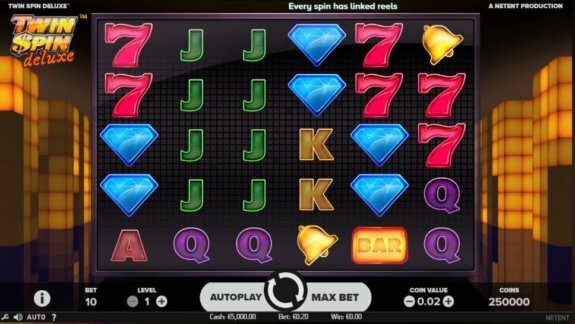 Playing Twin Spin Deluxe slot is similar to meeting up with an old friend as the game uses all the symbols that you are well familiar with in the original version of the game – Twin Spin Slot. Therefore, prepare yourself to win sizeable prizes with Bars, Bells, 7s, Diamonds and card symbols, and you could be one of the lucky winners to walk away with the €100K top prize!